2018 was supposed to be Myron Tagovailoa-Amosa’s breakout season. He clearly took a step forward last spring and was ready for a bigger role in the rotation behind starting 3-technique Jerry Tillery. Unfortunately that breakout never happened because his season barely got started. He broke his foot in week one against Michigan and wasn’t able to return until the Irish played Clemson in the Cotton Bowl. Tillery is now off to the NFL and MTA is ready to step up in Tillery’s absence. He’s feeling 100% healthy and is poised to have a big role on this year’s defense. Being out there with his teammates is what he missed the most last season. It was not an easy time last fall watching everyone play while he was forced to to the sidelines. “Definitely there is a spot where selfishness would kick in and you would kind of feel sorry for yourself,” Tagovailoa-Amosa admitted, “But if you’re going to be a good brother for your teammates you’ve got to put that aside and just support them no matter what. He did that and worked hard to get back on the field last season, but he had to be patient as the coaches and training staff wouldn’t risk putting him out of the field if there was a chance to re-injure his foot. With all of that in the rearview mirror, he is focusing on trying to follow in the footsteps of Tillery as an interior defensive lineman. What Tillery was able to accomplish was special and MTA did his best to learn from what made Tillery so successful. Pass rush is an area where we have not seen the defensive line have much success during the spring compared to last season. That’s something the group is fully aware of and they are working hard to raise the bar from where it was previously. It may have been a difficult season, but he is happy to be in the spot he’s in now as the projected started at 3-technique. The way he looks at things compared to last spring is different and he wants to be a player that leads by example for the rest of the defense. “The mindset is to go out there and dominate,” Tagovailoa-Amosa said when asked about how things changed from last year to now. “I think as a defensive player you want make your presence be felt on the line of scrimmage and obviously being the starter now going out there with the first team and having first reps, you’ve got to set the tone. You’ve got to be the tone-setter of the defense. 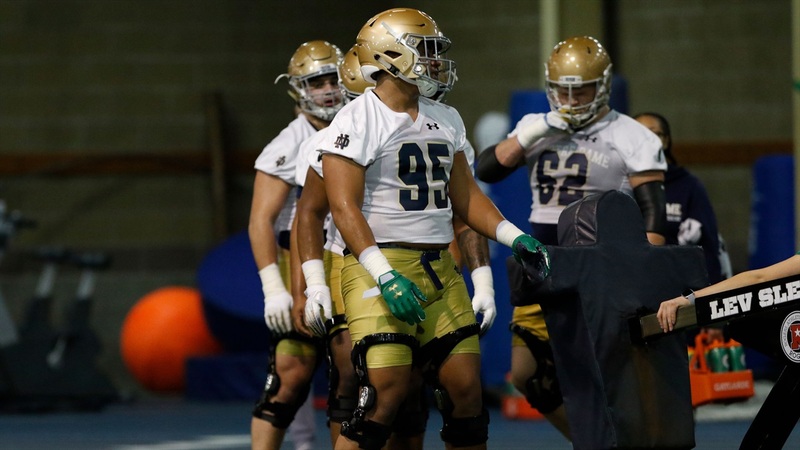 It won’t be easy for the Irish defense to push further than they did in 2018, but with players like Tagovailoa-Amosa stepping in to attempt it, we know they will do everything they can to raise the bar in 2019.